The View is Spectacular. And the Lifestyle is Even Better. Amrit Ocean Resort and Residences sits on a quiet stretch of the Atlantic shoreline, removed from South Florida’s hustle bustle world. It’s the perfect, secluded spot to practice mindful, balanced living. Yet, these oceanfront Palm Beach luxury condos are central to the best the area has to offer—just minutes from posh Palm Beach Island, lively West Palm Beach and elegant Palm Beach Gardens. 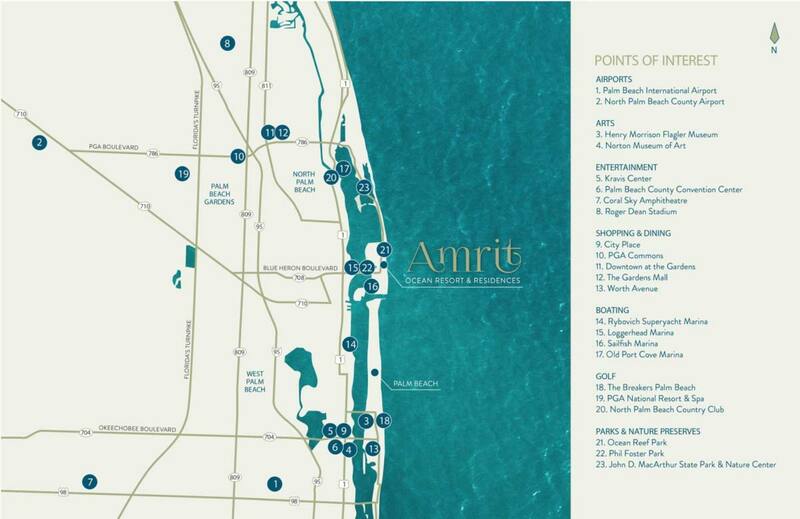 Amrit is a convenient home base for the area’s finest shopping, dining and entertainment, world-class golf courses, lush parks—and just twenty minutes from Palm Beach International Airport. And, as an oceanfront resort, the clear, warm waters right outside your door are the perfect place to enjoy some of the world’s best watersports, including boating, fishing, diving and more.